This curling iron is a quality product. I wanted a larger barrel for more of a wave than a curl. This iron delivered. It comes with a barrel cover to protect drawers or suitcases as well as the iron itself. Love it. Style your hair with ease with the Conair Infiniti Nano curling iron, and say goodbye to singed hair. 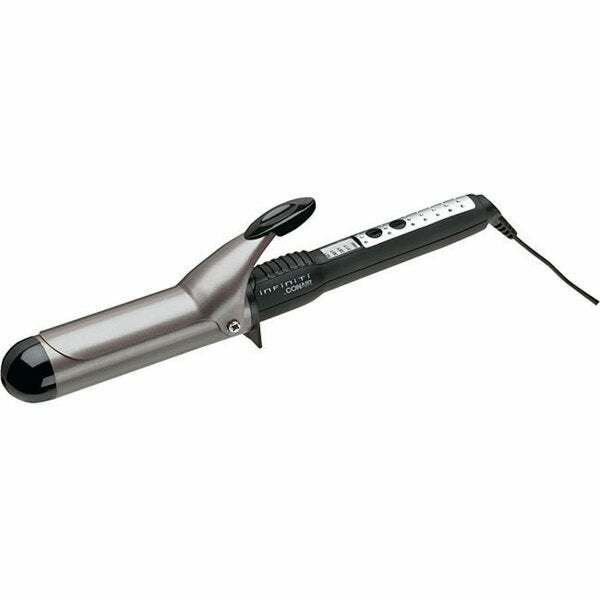 This tourmaline ceramic iron evenly warms and curls your hair without overheating. Frizzy hair is no longer a problem, since this tool emits ions to gently style your hair and bring out its natural sheen. A nine-foot professional swivel cord allows you to comfortably work from every angle. Safety features include a protective heat shield and automatic shut-off functionality. I was trying to fine a curling iron for my thin fine hair that would not damage it and make it frizz. This iron works great, it has the tempeture settings right on the front and the instructions inform you what setting is the best for your type of hair. This Conair Infiniti Nano Tourmaline Instant Heat Ceramic Curling Iron is made well and works well. I have very thin hair and this curling iron gets too hot for my hair, but it will work well for others and it is as described. I want to say, I see a lot of people gives bad reviews on product because the product doesn't work for them but the product does what it was meant to do, that's why I gave it 5 stars. You can get mad and give a bad review if you buy a T.V. and it doesn't make toast, haha. I recommend this curling iron for people with long and thick (or not very thin) hair. Heats up fast. Only problem (like another previously said) is that its really easy to turn it off my accident when you are using it. The on off game gets annoying if you don't figure out another way to hold it to avoid this. Also at the moment i have kind of long hair, it didn't really give me the curls I was expecting, curls the ends but that's about it. Maybe it works better on shorter hair? Kind of disappointed. This curling iron is great for the price. It heats up really fast and doesn't catch my hair at all. The only problem is that it's really easy to accidently turn it off while you're using it. Gets hot, curls hair with ceramic technology works great.... Need I say more? I have had this iron for about a year now, and it works wonders. My sister loves it too! The quality is great it gets super hot and does an amzing job curling mu coarse hair. I never travel with out it. it's a very nice curling iron , easy to use, clearly written heat settings,perfect size for medium to long length hair, gives great curl! The curling iron I received did not have a smooth barrel cap as pictured. Mine had a ridged barrel cap, which is what you will find if you search for this curling iron on other websites (you will also find a much lower price than the $$ I paid on overstock). On the plus side, this curling iron does get hot as others have said. However I actually prefer a stainless steel barrel which leaves my hair smoother and shinier than the tourmaline coated barrel on this one, so this one will be relegated to backup status. I have med thickness hair and color it this does not work on my hair. You have to leave on long and then burn your hair. Gentle on my hair, several settings, and easy to hold because it's lightweight. Like the small loop for hanging out of sight. I am happy with this purchase. The only thing is it is kind of bulky but I do love the outcome! I am very happy with my purchase. I didn't realize how bad my old curling iron was until I received this one. The various temperature setting are a plus too! Holds heat well and great temperature adjustment feature. A good size for a loose curl. Perfect for my long hair. Great price! Ordered for my niece. She liked it. Just what I needed for shoulder length hair. Because I dropped and broke the one I had.